This is absolutely perfect for Halloween. There’s almost nothing spookier than Edgar Allen Poe’s The Raven as being read by James Earl Jones. If you get out there on YouTube, you can find readings of The Raven by Christopher Walken and Vincent Price, too. For me, Price’s version is the one that I liked the best. Enjoy! Seems like a nice, creepy way to celebrate All Hallow’s Eve, right? Enjoy! One of the things that I hate doing here at JerseySmarts.com is posting random entries. However, as you may have noticed October was a choppy month for consistent updates on the blog. There are some good reasons for this – most of which you’ll read about right here on the blog in the coming days and weeks. For example, I had one hell of an experience getting my Honda Civic fixed at the local dealership’s repair shop. The experience was so completely out of control, that I began writing about it last week and I’ve crafted an entry that is, I think, pretty damn entertaining. You should look for that entry coming at some point this week. Sigma Pi Educational Foundation: I make no secret out of the fact that I donate my time, talent, and whatever treasure I can scrounge up to the Sigma Pi Educational Foundation. With respect to that “talent” portion of my contributions, since August I’ve been heading up the Foundation’s strategic plan study group. This duty has allowed me to work closely with some of my fellow Trustees as well as some volunteers – all of whom are looking for a better, stronger way forward for the Foundation and Fraternity alike. Earlier this week we held the last focus group conference call which capped a two and a half week period of these types of calls – many of which I was on for over an hour. I’ve compiled a preliminary, raw data report and sent it out for the study group’s review. Later this week we’re going to have another conference call and then I’m going to spend some time compiling a final report to the entire Board of Trustees. However, the work isn’t over yet. In a few weeks I’ll be heading to Nashville, Tennessee to present our research findings and then to lead the larger strategic planning process with the entire Board of Trustees. This process will be capped off during the December/January time frame and then, finally, I can take a breather on this stuff! By the way, click here if you want to make a small, 100% tax-deductible donation to support the Foundation’s scholarships. Preparing for a Family Night: Over the last few weeks, I worked with my brothers and future sister-in-law to plan for a family night and dinner for my Mother’s recent birthday. We had the family night and dinner last night and it was a lot of fun, I think. In fact, one of the best things to come out of last night was a family discussion about reducing our excess spending on Christmas this year because, frankly, we’re all working towards specific financial goals that require a dedicated planning effort on our parts. It was a great conversation and a great conclusion, I think. Plus, spending the night with the family for dinner to celebrate my Mother’s birthday was a great time! Financial Planning Roadblock, Courtesy of NJHESAA: I’m not sure yet, but I might spin this little blip off into its own entry to mimic an entry that I wrote both one month ago and many months ago. The long and short of it is that I sent a $1,000 payment to NJHESAA on Monday, October 18th. The check was finally posted to my account on Thursday, October 28th. But that’s not what has me completely frustrated and aggravated with this anti-customer service organization. What bothers me is that I sent a $4,300 check to NJHESAA on Tuesday, October 19th and here we are on Saturday, October 30th and the check hasn’t been posted to my account yet. What the Hell is NJHESAA waiting for to post my damn check?! This isn’t hard, NJHESAA – I know you have the check now post the damn thing to my account for goodness’ sake. I can’t wait to be done with this miserable, horrible organization. NJHESAA could learn a thing or two from the United States Department of Education about customer service and making the student loan repayment process easier for the borrower. Because, at this point, NJHESAA’s payment processing system is borderline ineffective which tells me that there has to be some incompetent people working there. What else could bring on a nearly two week delay?! Financial Projections and Forecasting Stunted: As you might imagine, because of NJHESAA’s inability to process a check with any semblance of efficiency, my financial projections and forecasting has been stunted for the last few weeks. For a guy who checks each of his accounts both in the morning and at night (and sometimes in the middle of the day), waiting for these bozos to post this check is torture. I’ve been adjusting my projection models by $4,300 every time that I go in there and make a move. It’s annoying. I have a lot of financial goals that I expect myself to achieve in the coming weeks, months, and years and with my ability to precisely project when my dollars will be posted to various accounts, it makes planning for the immediate future very difficult. Bizarre Indian Summer: I’m not going to spin this out into its own entry because it’s short, but if you live in New Jersey then you know that we had this weird Indian summer hit us in the last week or so. Before the mini-heat wave hit, I went out and purchased a radiator for my bedroom and it’s awesome! It actually warms up the entire second floor of the townhouse – can’t complain about that at all! Beginning to Complete Coursework: Some of you may remember that I’m actually enrolled in an independent study course at the local college where I teach. Successfully completing this independent study will give me a Public Relations Specialist certificate. Not too bad, huh? I’ve read through the material for the course and, once the final strategic plan report is completed for the Foundation (see above), I’m going to aggressively complete the required coursework for the independent study. I’ve decided that this is going to be the last course that I take for a while since it will complete the certificate program. Also, I don’t want to go back for more education until my life calms down just a little bit (which I think is coming within the next two years, thankfully). Some Consistency at the Local Gym: Hey – I’ve been going to the local college gym at least once each weekend for the last three weeks. Not bad, right? And now you know why I’ve been able to read so much in the last few weeks – I’ve been on the treadmill. I’ll be heading to the gym tomorrow morning before the trick-or-treaters start knocking on my door. While my results at the gym haven’t been overly impressive (I’m not necessarily losing a bunch of weight – a pound here and there maybe), I am pretty pleased that I’ve been able to make it there one day each weekend during a very busy, crazy time for me. Unending Projects at the Office: Hovering above all of the stuff written above is the fact that I have a pretty busy, increasingly stressful day job. Part of that stress comes from the person that manages my department and her mood swings, part of that stress comes from a changing workplace that expects the existing employees to transition to a new organizational structure without officially telling us what that structure will look like (or interviewing us for new positions), and part of that stress comes from the daily grind stuff that needs to be completed day in and day out that is made harder by the fact that my particular department is well-understaffed and thus we all have to do four/five different jobs each. And when you add in the fact that I’ve been doing a lot of the communication work for the organization – you can see how the stress builds up. Very annoying and, frankly, until this day-to-day stress goes away (which better happen soon), I think some of the other goals I have for my health and finances are going to be hard to achieve. Changing the Face of Usable Web Solutions, LLC: Thankfully, after months of trying, I’ve successfully spun off one of my last remaining problem clients. Sure, the client screwed me on the way out the door, but I’m so excited that this client is gone that I don’t even care any more about the screw job. Whatever. Removing this client effectively removes more stress from my life and, ultimately, makes Usable Web Solutions, LLC a stronger, better organization. And with that, I’m beginning to change the nature of this small business. In the future, I’m going to focus on websites that are owned by the company and bring in advertising revenue because, honestly, that’s where the money is in this online business stuff. Going out there to find independent clients is not the way to find success in the website world. There are a few different items that I’ve been working on that I didn’t think would find full entries on JerseySmarts.com. However, this stuff may be of some importance to a few of you so I hope that you enjoyed reading! One of my favorite parts of the old Joe’s Journal was that crazy header that I put together by blending all of the different things that crossed my mind at the moment. You might be able to tell from that screenshot, but there are a whole bunch of different things on there including the Monmouth University hawk, Stewie from an early episode of Family Guy, the Arrested Development television show’s logo, a Cross, the American flag, my fraternity’s flag, a Lord of the Rings logo, a Smallville logo, a silhouette of New Jersey, a Rutgers University logo, and a bunch of other stuff. Plus, the main color of the site was yellow. 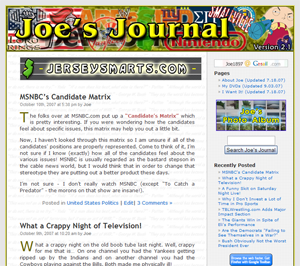 In general, I never hate on any of my old sites and Joe’s Journal is no different. I really enjoyed that blog since it was my personal blog where I let off steam and commented on a variety of issues (the entries have all been merged into this site, so go back a few years and look at some of the older posts – lots of bitching in there!). However, as I began to enterprise my web design skills and I began creating newer websites with stronger capabilities and better marketing opportunities, I realized that I had to begin eliminating duplication in those areas of my life where it was unsustainable and, really, unnecessary. On that point, a few years ago I opened up JerseySmarts.com as a place where I could capture some of the writing skills of my friends from college and other people that I’ve met along the way. It never really panned out the way I wanted it to, but that’s okay. Since JerseySmarts.com became a viable source of revenue, I wound up keeping the domain and just uploading my Joe’s Journal entries onto both blogs. It was easy, but pretty laborious in the grand scheme of things. I never wanted to engage in larger marketing campaigns or new ways to present content because I didn’t want to have to duplicate everything. Plus, I felt like the impact of my entries was being thinned since they were available in two locations. The logical answer was to merge the two blogs and condense my efforts to create a single website with greater impact. I think that I’ve been pretty successful in that effort considering that JerseySmarts.com is both profitable and has a wide readership. Since the merger, I’ve admittedly held back on publicizing the blog to the extent that I originally intended and part of that was because I wanted to ensure that I had the commitment to keep the thing updated. With that, I’m glad to announce that today marks one full year of this blog being updated every single day. In 365 days JerseySmarts.com has had more than 365 entries. I think that’s a pretty significant accomplishment for a one-man show. One of the ways that I accomplished this was taking advantage of the ability to “schedule” a post in WordPress. For example, I wrote all of the entries for November 1st through November 16th (that’s today) on Halloween. Hey, I had the free time while sitting around waiting for trick or treaters, so I wanted to use it productively! I can’t guarantee that I’ll be updating the blog on a daily basis for the coming year, so I might miss a day here and a day there, but I made it work in the last year so I might be able to keep the momentum going in the coming year! If I had my way, I’d get more people to sign-up for the monthly newsletter in the next year and I’d utilize that newsletter for more than just a recap of previous entries. I think that goal is attainable, but not when the newsletter stands at 26 subscribers. Last month I started a new Google Group which replaced the old newsletter system that I’ve been using for the last year. Let’s hope that it has some staying power, huh? Anyway, we’re one year into this merger and I think it’s going great. Let me know what you think!